Compare to Accutome*, Bausch & Lomb*, Katena*, Diamatrix*, Ambler Surgical*, MSI*, Meyco*, and DGH*. Black synthetic diamonds - offered in most common styles. Handles are made in the USA from titanium and high-quality aluminum (economy knives only) and blades are honed from gem-quality diamonds. Handles have a lifetime warranty. 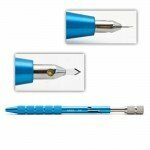 Stab or Side Port Incision: Our most popular is the 1mm stab knife. 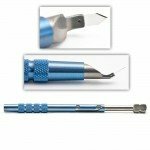 Diamond Knives with a single foot plate: Depth is set at 600, 550 microns for Limbal Relaxing Incisions (LRI) or 200 microns for use in groove incisions. Phaco or Anterior Chamber Entry Knives: In widths of 2mm to 3.2mm. These are offered in lance, spear, clear cornea, and trapezoid styles. 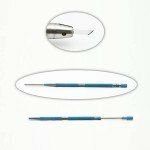 Advanced blade geometery offered to enhance incision architecture for self-sealing incisions. Step knife Handles allow the surgeon to select up to 4 depth settings and in the blade can be extended to be used as a freehand knife. 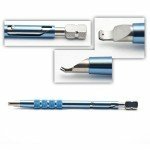 Micrometer knives for use in Penetrating Keratoplasty allows unlimited adjustment of the depth of the blade and a dual footplate ensures accurate depth and smooth incision. These are only a few of examples of our extensive line of German-made, American-made, and high-quality diamond knives. Don't see what you're looking for? Browse our website, use the search function, or contact an Instrument Expert for more information! 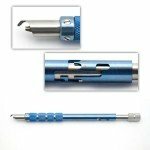 Short LRI Diamond Knives for Use with Slit Lamps. 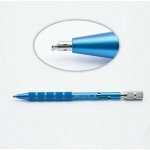 Product numbers vary based on the specifications required by the surgeon. Our diamond knives can be customized, so feel free to contact an instrument specialist for more information or to request a quote!